UFaceKit is a project providing an high-level, widget toolkit independent UI-API ranging from SWT over GWT to potentially Android. 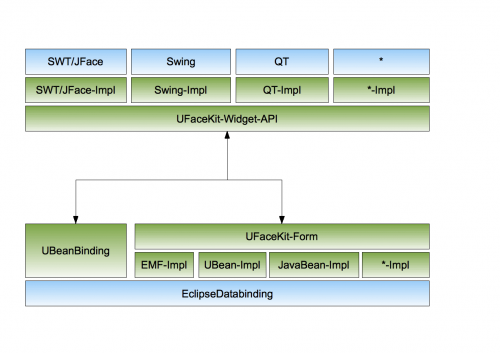 UFaceKit works on different levels using a layered setup first and fore most UFaceKit needs to have an Eclipse-Databinding for Widget and Model-Technologies it wants to use. Some of them are provided by other projects (SWT-Observable, EMF-Observables) and UFaceKit reuses them. For other technologies it provides the implementation as part of the UFaceKit project. Modules in this section hold technology specifc implementations from generic APIs ranging from UFaceKit-API to Databinding-API for example IObservable implementations for Swing-Controls.